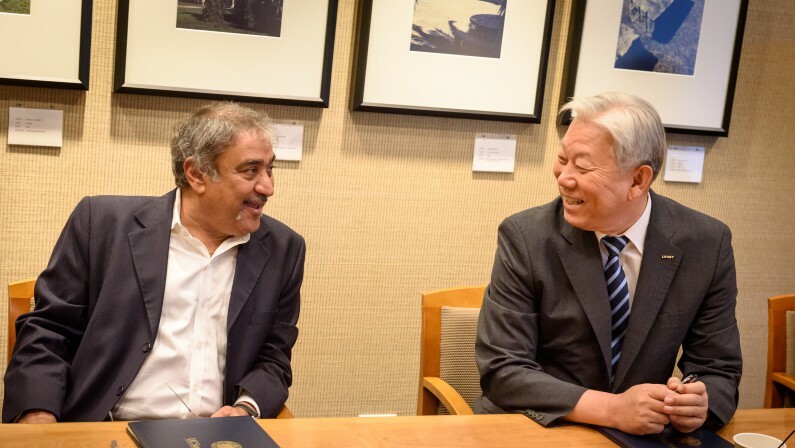 UNIST President Mooyoung Jung (right) is talking with US San Diego Chancellor, Pradeep K. Khosla (left) at the signing ceremony for the MoU. UNIST and UCSD sign cooperation MoU to support startups and technology commercialization. UNIST also partners with LIT to help UNIST to enter international markets. On August 12, 2016, UNIST and the University of California, San Diego (UCSD) signed a Memorandum of Understanding (MoU) to pledge mutual support for one another in the advancement of research that will benefit our global society. The ceremony was attended by UNIST President Mooyoung Jung, US San Diego Chancellor Pradeep K. Khosla, Prof. Hyug Moo Kwon (Dean of School of Life Sciences, UNIST), Prof. Kyungjae Myung (Director of the IBS Center of Genome Integrity, UNIST), Prof. Sung Chul Bae (Director of UNIST Academy-Industry Research Corporation), and four other key personnel from UDSD. Attendees from the signing ceremony for cooperation MOU between UNIST and UCSD are posing for a group photo. In the memorandum of understanding, the two organizations also promised to foster new collaborations and programs in areas such as advanced materials, biology, energy, technology management and commercialization. “Through this MOU, our two organizations are expected to generate a strong synergy effect by cooperating on a broad range of common interests, including our commitment to facilitate commercialization and overseas technology transfer,” says President Jung. He adds, “UNIST has already launched UC Berkeley’s new Global Innovation Campus Program (GICP) and will keep on expanding its global network, thereby becoming a hub for global technology commercialization. 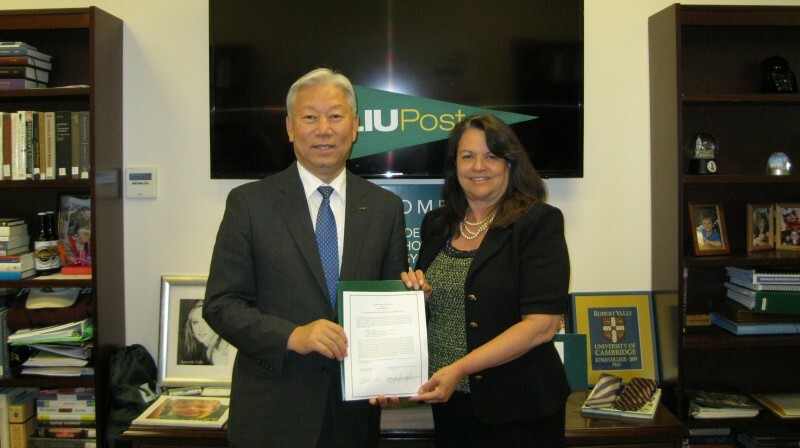 UNIST President Mooyoung Jung (right) signed the MOU with President Kimberly R. Cline (right) of Long Island University on August 7, 2016. During his stay in United States, President Jung also met with President Kimberly R. Cline of Long Island University (LIU) to discuss ways to strengthen cooperation in research cooperation, as well as to help UNIST to enter overseas markets.